ANAS RAHAMAT WINS XMAS CUP WASPA IN SINGAPORE!! 8 players participated in this and they were drawn into 2 groups with the top 2 progressing to the semi-finals while the respective 3rd-placed players played-off for 5th/6th and the respective 4th-placed players played-off for 7th/8th. 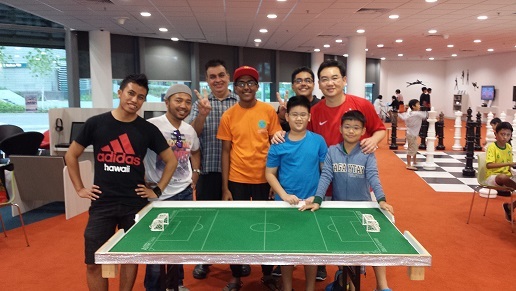 Group A comprised of: Isaac Lim, Anas Rahamat, Ezan Ahmad and Noor Haikal while Group B comprised of: Luke Lim, Vikas Chandiramani, Bernard Lim and Chandru Chugani. Both Anas and Bernard played true to form and topped their respective Groups; while Haikal and Vikas finished 2nd in the respectively. Ezan and Chandru finished 3rd to battle for 5th/6th placing ;while Luke and Isaac, the only 2 Junior players battle out for 7th/8th placing. With both players in preparation for the upcoming SGTF League Season 2015, Ezan ended-up eventual 3-1 winners to take 5th Place. The 2 Subbuteo-playing Brothers, played out a often-seen derby game; with younger brother Isaac showing more composure to make his chances count to win 3-0 and take 7th Place. In the semi-finals, Anas edged out Vikas 1-0 in a very tight affair; while Bernard fully capitalized on Haikal’s numerous defensive errors to progress into the Final. The cool-headedness of experience triumphed over the exuberance of youth in yet another tight affair between Vikas and Haikal, as Vikas took 3rd Place with a 1-0 victory. In what was a repeat of the recent Merlion Cup barrage play-off; this time Anas took full revenge with a solid defensive display and his trademark quick counter-attacking and moving-ball shots to catch Bernard unawares and out-of-position defensively. It was sweet revenge for Anas as he won the game deservingly with 2 goals. Congratulations Anas !! … and well done to all participating players ! !